Back pain in children is shown to interfere with their daily activities. It reduces their quality of life and causes some children to even miss school. Always teach your child how to properly wear and load his backpack. Irrespective how good a backpack is, its proper use is vital to minimizing risk factors for developing back, shoulder and neck pain. 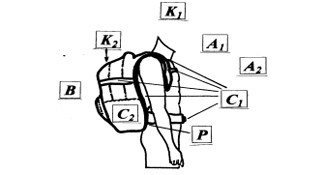 Construction features of a backpack are vital. Made of lightweight and strong material; and have two shoulder straps, a chest strap, a hip strap, separate individualized compartments and a flexible contour that can be adjusted to fit the curvature of the spine. Pelvic girdle (or hips) can support heavy loads. It acts like an arch with lateral pillars and a keystone applying the weight bilaterally down the hips and legs. Therefore, ensure that the bottom of the backpack rests comfortably on your child's hips. A2 Ask your child if he is experiencing any aches or pain with carrying his backpack. If so, ensure that your child properly wears and loads his backpack and if necessary, decrease the weight that he carries. C2 Correct size of backpack for your child. Bigger is not better. Ensure the proper height of the backpack.